Awesome pizza and serviceThin Crust EnjoymentI ordered the margherita pizza ($17.95), which was fantastic.Best Pizza & Salad Around! Kids love this pizza. Crust is soft and chewy not thin and crispy. 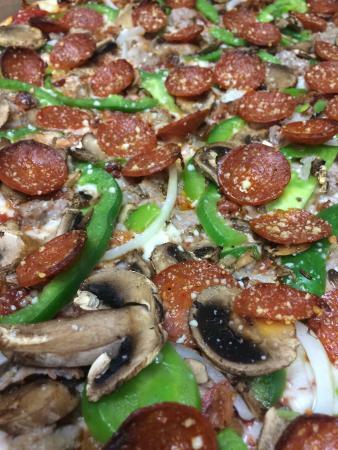 Full of toppings and always delivered fast and warm. Best Pizza & Salad Around! The place is very clean and tastefully decorated. Great service. Delicious and reasonably priced pizzas. Some of the best pizza I’ve had in Connecticut. Thin and crispy crust and delicious toppings. Small salads are more than enough for two people to share. Can get by the slice or whole pies. A favorite of mine when I come to visit. In its new quarters, the kitchen produces wonderful thin crust pizzas with many choices and a well made tomato sauce. A small salad is sufficient for two with a pizza. The salads are great. They have a liquor license for beer and wine. Their new location ( only a few doors down from the old location) provides booths for dining in. Food is consistently good. Get quick answers from E & D Pizza Company staff and past visitors.